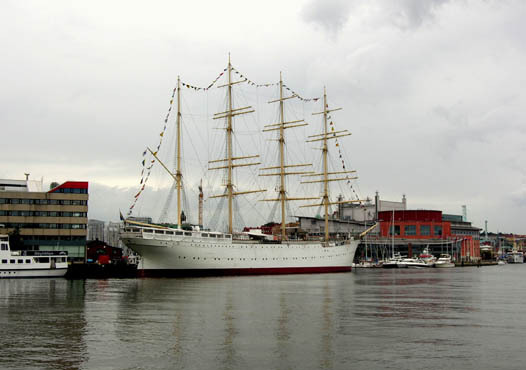 This is the site that greeted us on arrival in Gothenburg - the 4-masted schooner Viking, now a restaurant, etc. 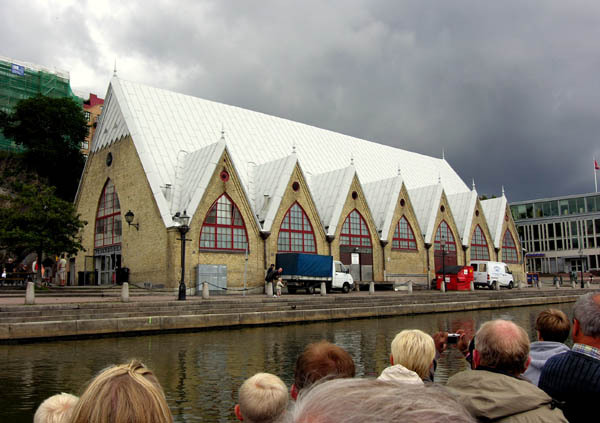 Lilla Bommen Harbor in Gothenburg. The building in background is known locally as "the Lipstick" for obvious reasons. 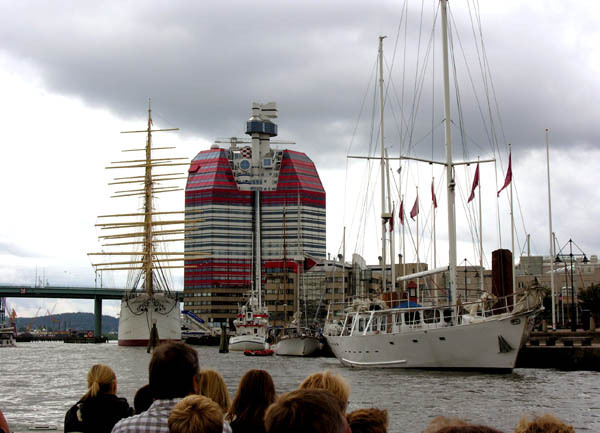 With Sno' Dog docked in Lilla Bommen harbor, we were in the heart of downtown Gothenburg - only 5 minute's walk to the largest mall in Scandinavia! 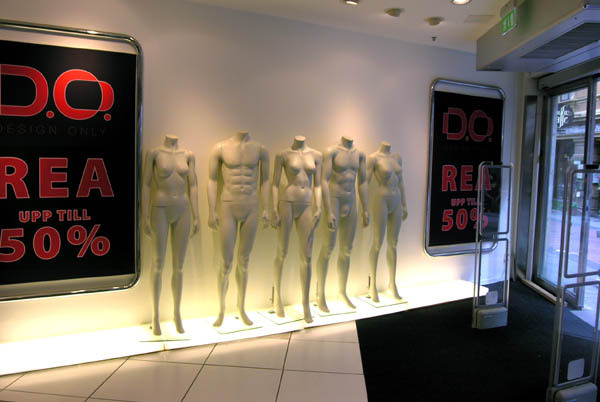 Photo above appeared to be the latest fashion - pretty minimal, but hey, it's 50% off. Click for larger view. 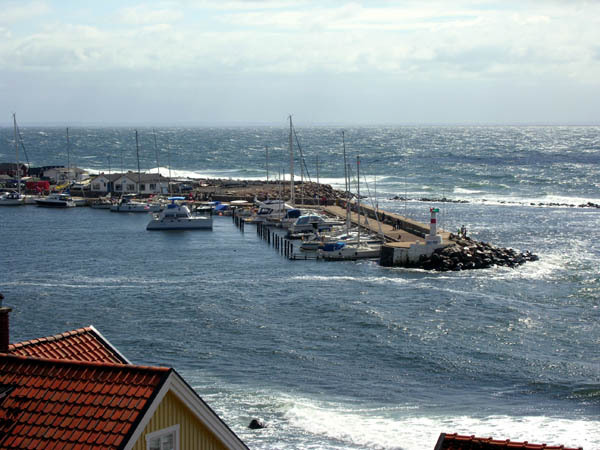 After some rough weather in the Kattegat, we were happy to take refuge the very cute town of M�lle on Sweden's west coast. 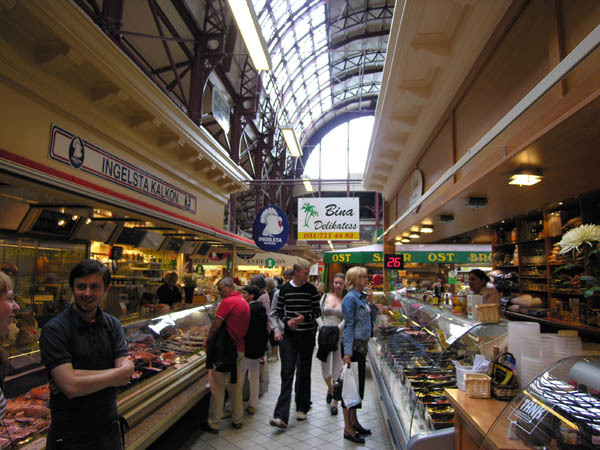 M�lle is famous as the first place (over 100 years ago) to have co-ed baths! Apparently Kaiser Wilhelm traveled up here by train from Germany to partake. Very scandalous, those liberal Scandinavians! 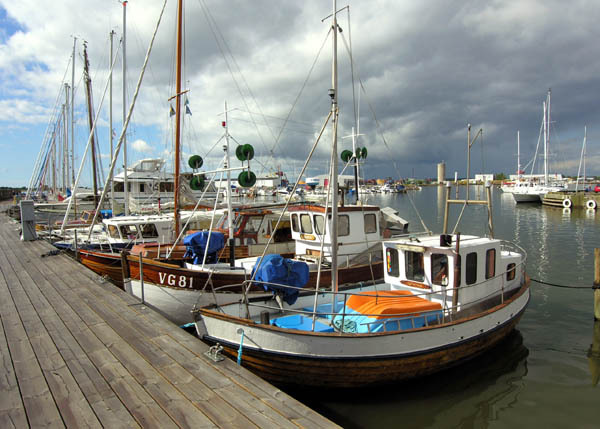 After staying almost a week in Gothenburg - waiting for high winds to subside - we moved on down the west coast of Sweden. 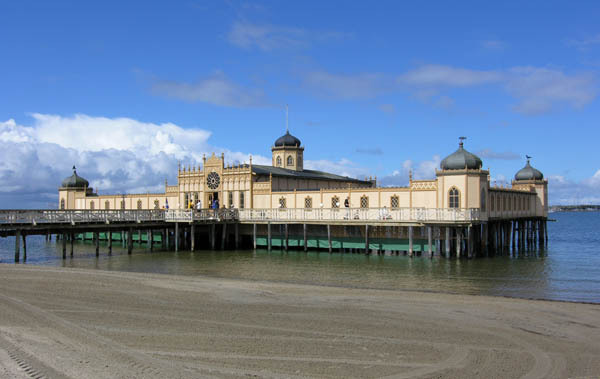 First stop was Varberg, the scene of yet another castle. 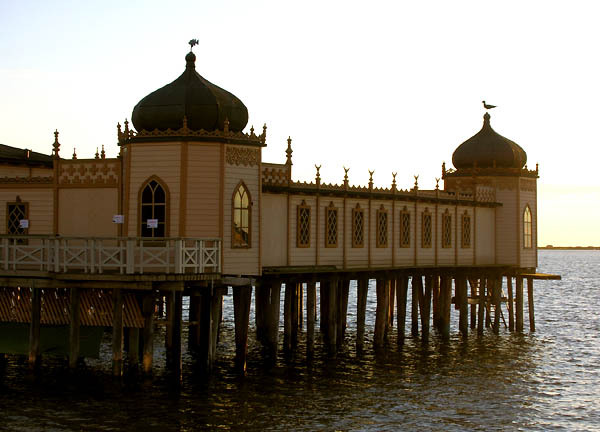 Also here was this gorgeous seaside bath (photos to right) now restored and open for bathing! 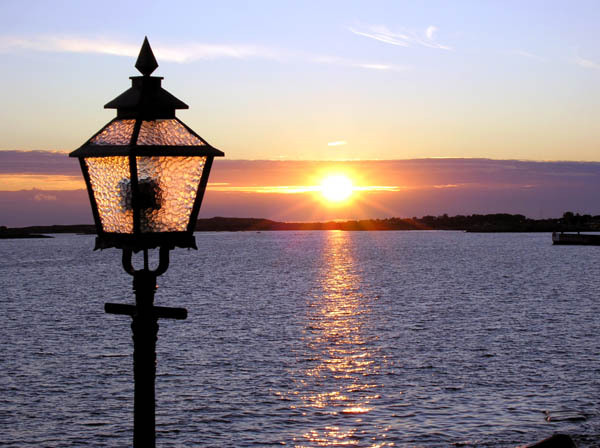 If you look very carefully at this photo, you can see the coast of Denmark in the distance - it's only 12 miles away. But a rough 12 miles! We waited for calmer weather to head down there. 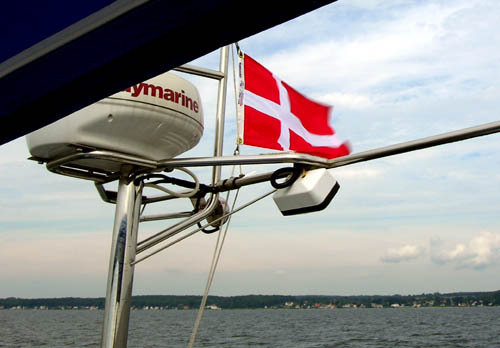 From M�lle, we headed south to Helsing�r in Denmark - where we replaced our Swedish courtesy with the red and white cross of DENMARK. 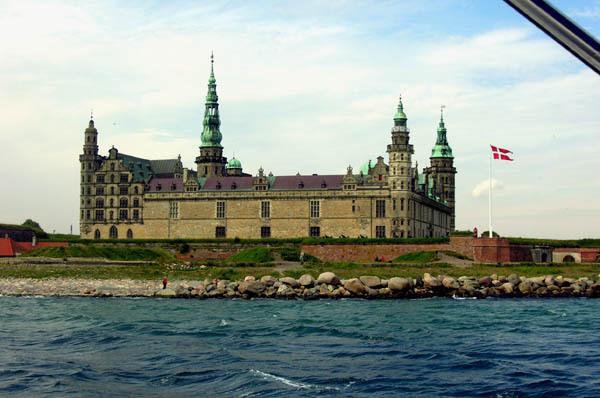 The famous Kronborg Castle in Helsing�r - site of Shakespear's "Elsinore" in Hamlet. Welcome to Denmark! 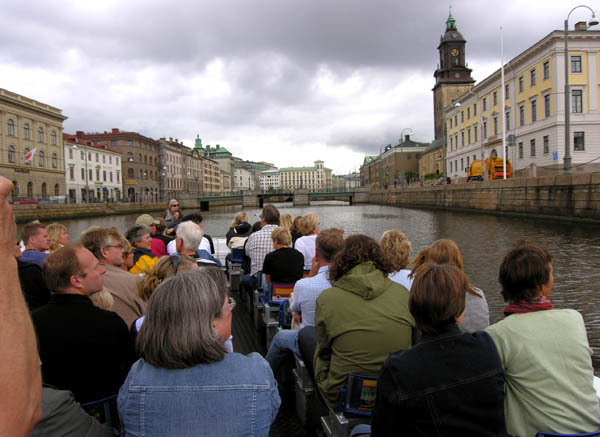 With another day of rest in G�teborg (Gothenburg) - the first time on this trip we have stayed more than two nights on one place - I've had time to bring the ship's log up to date. Here are some numbers: We departed Rauma (Finland) on July 5th - today is July 25th - we have now been en-route for 20 days. 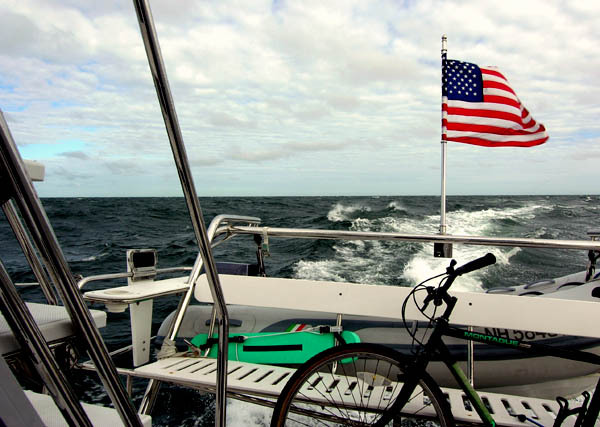 Total distance under our keels is 505 nautical miles, engine time: 64.5 hours. This yields an average speed of 7.8 knots - this includes time spent idling while waiting for locks. Through the G�ta Canal the speed limit was 5 knots. Our fuel consumption has been remarkably low. As of our last fill-up we had used a total of 699 Liters (185 US gal) of diesel fuel. Dividing this by our engine hours gives an average fuel burn of 3.16 gallons per hour. So far, it's been a trip of a lifetime! Never a dull moment, but no major problems. We glad we're here. Sadly, the PDQ sites above have been discontinued. which uses many of my photos - without any credits!